It’s no secret that businesses have a limited budget when it comes to marketing. It’s also no secret that marketing is critical to any business’s success. Failing to market, or to market efficiently can hurt your business significantly. To have a successful marketing campaign, businesses need to get the most bang for their buck by targeting relevant potential customers. It wouldn’t make sense for a fitness studio for women only, to target the entire population of men and women of all ages in all locations. It makes sense to specifically target women that are likely to use your service within a short distance of your location. You’ll save money, maximize your marketing dollars, and get your service to the audience likely to use it. New Bedford Guide is now offering businesses the opportunity to target relevant customers by sponsoring NewBedfordGuide.com articles. NewBedfordGuide.com and our Facebook page reach over 90,000 southcoast, Massachusetts residents so this is a great way to promote your business. The program matches up businesses with articles that are relevant to their business. For example, a nature food store would want to target articles about health, fitness and diet. A hotel may want to sponsor articles about major events in the local area that bring in crowds from a distance. People who are reading the articles have already expressed an interest in the topic and will be likely to check out the relevant product or service. Sample of sponsor banner ad at the end of an article. Sponsors get a large leader board-style banner at the end of the article they sponsor. An example can be seen here. 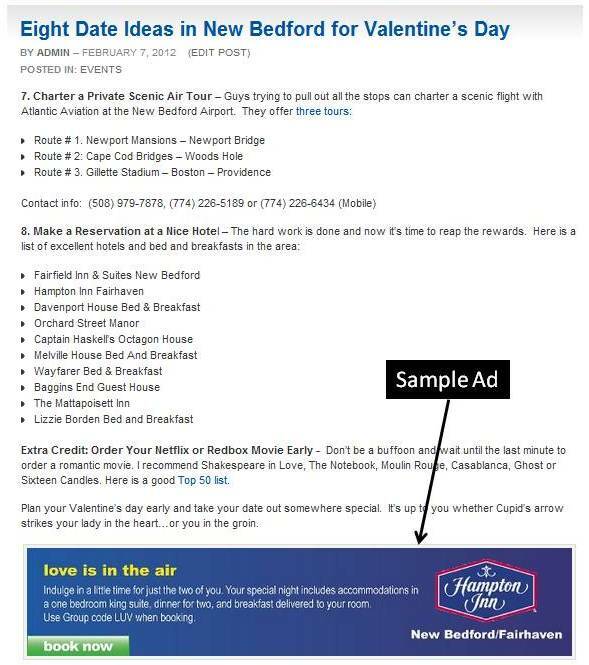 The article is titled, “Eight Date Ideas in New Bedford for Valentine’s Day.” The sponsor is The Hampton Inn with their Valentine’s Day specials. When clicked, the banner leads to Hampton Inn’s website specials where customers can get more information and order the service. There are two ways for businesses to sponsor NewBedfordGuide.com articles. First, a business can sponsor existing articles on our website, which still generate traffic. Second, business can work with us on current article ideas and sponsor upcoming articles that are relevant to them. For example, we do weekly and monthly series that businesses could sponsor, or we could come up with a relevant article. You will be inexpensively targeting relevant customers. All articles show up well in Google and other search engines. All articles are promoted on our Facebook website (reaches 90k people) and other social media/bookmark sites. You will be sponsoring a small local business and local writers, promoting and furthering your brand. Want to sponsor a current or future article? Contact us at info@newbedfordguide.com. Article sponsorship costs $200 per article. Banners must be provided or developed by us at an addition cost.